Prominent Non- Governmental organisation and a Pro-democracy group- HUMAN RIGHTS WRITERS ASSOCIATION OF NIGERIA (HURIWA) has condemned as reprehensible and the clearest signs that the forthcoming Presidential poll has already been technically manipulated, the appointment of a biological relation of President Muhammadu Buhari Mrs Amina Zakari by the Chairman of the Independent National Electoral Commission (INEC) Mahmood Yakubu to head the core committee to coirdinate the collation of the results of the general election in which her uncle and the incumbent President Muhammadu Buhari is the candidate of the All Progressives Congress (APC). HURIWA rates the job of head of collation committee as same with the centrality of the role of a central referee in a football game. HURIWA has also asked the National Assembly to declare a state of electoral emergency and pass a vote -of -no -confidence on the hierarchy of the Idependent National Electoral Commission which would translate into the dissolution of the election management board and the appointment of a brand new team of impartial amd patriotic Nigerians to head the electoral umpire and conduct free, fair, transpatent and unbiased Presidential and general election next Month. This process must be done according to the Right group as the only way to insulate the election from the already compromised preparation put in place by the President Muhammadu Buhari's administration handpicked Chairman of INEC Yakubu Mahmood. HURIWA in a statement by the National Coordinator Comrade Emmanuel Onwubiko and the National Media Affairs Director Miss Zainab Yusuf said: "We have just ended a six hours long national emergency parley in Abuja of our core national leaders and the leaderships of over 35 Non Governmental organisations and our attention dovetailed into the emerging but very extensively ethically damaging national emergency now occasioned by the illegal and immoral appointment of blood niece of president Mrs Amina Zakari the Biological blood relation of President Muhammadu Buhari to head the collation of results team for the most strategic national election in Nigeria's nascent democracy in which her uncle President Muhammadu Buhari is desperately interested in winning a second tenure and is hotly contested by some distinguished Nigerians. This aberation of this heavily compromised INEC is like making a sister of a goal keeper of one of the two competing football teams as the central referee of the most competitive finalists' match and you expect that there will be fair play and justice. Doing such a morally damaged action is like match fixing. What has happened today in INEC with the ill advised decision of Yakubu Mahmood to give the most sensitive appointment to the biological blood sibling of a major contender in the same electoral contest amounts to the electoral equivalent of MATCH FIXING just like how some rogue elements fix football matches with very extensively damaging implications for the game of professional football. This current Chairman of INEC is surely an agent of distabilisatoon and electoral manipulation. We have on many occasions asked for the removal of the duo of the Chairman of INEC and the Niece of the President Mrs Zakari Amina who is a national commissioner in INEC because we have always maintained that she has played less than dignified roles as INEC's national commissioner in the last three years to such an extent that almost all of the elections conducted in the last three years in which she played pivotal supervisory roles have always ended up been manipulated in favour of the political platform of her uncle the ALL peogreasives Congress which tendencies have whittled down the integrity and credibility of the electoral process in the Country. We are giving the Chairman of INEC 48 hours to rescind this toxic decision or the organised civil society community will meet and take a range of actions to draw the attention of the global community to this criminality and outright rigging that has already started to unfold. Nigerians of good conscience must reject this criminality of INEC and we call on the National Assembly to rescue the February Presidential election from the clutches of hawks in the Presidency bent on rigging the election by all means and foisting an unpopular winner on Nigerians which may snowball into long drawn civil strife with briad based consequences for the survival of constitutional democracy. Nigeria is about to be destroyed through carefully choreographed electoral heist and the World watches without acting to stave off the danger which could constitute the greatest threats to Africa and the World". 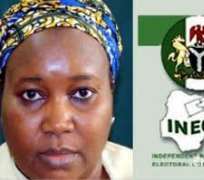 HURIWA recalled that the Independent National Electoral Commission (INEC) has appointed a National Commissioner in the commission, Mrs. Amina Zakari, as the chairperson of the presidential election collation committee. Mrs. Zakari, a former acting head of the commission, is said to be President Muhammadu Buhari’s niece. The main opposition party, Peoples Democratic Party (PDP), has described Zakari’s appointment as “outright manipulation.” PDP also challenged the President to excuse his niece from such a critical assigment if he’s actually committed to free, fair and credible elections.